The Serengeti - synonymous with the Great Migration that takes place every year. Over two million wildebeest, and thousands of zebra and gazelles, trek hundreds of miles across the vast plains in their quest to find richer grazing land. The Ngorongoro Crater is about 20 km across and 600 meters deep, and is home to an estimated 30,000 animals, making this one of the densest concentration of wildlife within Africa. The tropical paradise of Zanzibar boasts white sandy beaches fringed by palm trees that sway gently in the breeze and crystal clear, warm turquoise waters. The vast Selous Game Reserve is home to the largest concentration of wild dog in Africa. Vast open plains teeming with migrating wildebeest, idyllic palm-fringed beaches, and snow-capped mountains...this is Tanzania. A holiday here will leave you with outstanding memories for ever. If you would like to get some personal help and guidance on your trip from one of our experienced travel consultants then you can ask us to help plan and book your trip. The largest country in East Africa, Tanzania is renowned predominantly for its wildlife, and offers unrivalled wildlife viewing opportunities. The country is home to Africa’s largest mammal population and the 2nd largest number of bird species ever recorded (around 1,500), so for both the first-time safari goer or regular safari enthusiasts, the experience will be truly unforgettable. The Northern Safari Circuit is the biggest draw for most people, as the game viewing opportunities are endless, and there really is nowhere else where you can witness such a variety of wildlife. The Serengeti is probably known throughout the world as being where the famously impressive Great Migration takes place. Every year over 1.5 million wildebeest, 200,000 zebras and 350,000 gazelles congregate on the Serengeti plains, and make their way clockwise en mass on a 1,800 round mile journey to Kenya’s Masai (also spelled Maasai) Mara in search of greener grazing land, before returning southwards again. Close on their heels (or should we say hooves) throughout this dangerous journey are hungry predators - mainly lion and hyena, but in a couple of places along their route, they also have to contend with crocodiles too. The Ngorongoro Crater is without a doubt one of the most beautiful parts of Tanzania, and for safari goers, it has the appeal of hosting the densest concentration of wildlife in Africa, offering truly incredible game viewing opportunities. 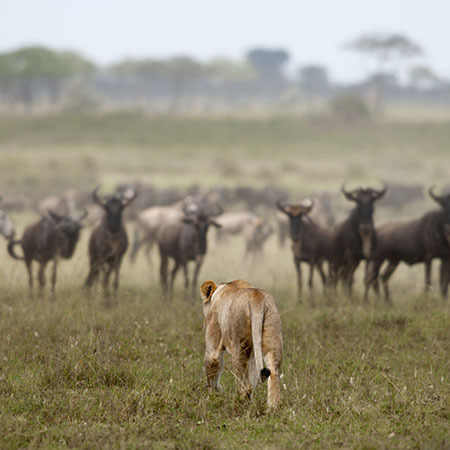 Black rhinos, buffalo, hippos, lions, leopard, zebra, wildebeest and gazelles are frequent sightings. The deep, volcanic crater itself is the largest unflooded and unbroken caldera in the world, and measures about 20 km across, 600 meters deep and covers 300 km² in area. In addition, however, to these wildlife destinations, the Northern Safari Circuit also boasts the scenic Lake Manyara National Park, as well as the quieter National Parks of Tarangire and Arusha, not to mention Mount Kilimanjaro, Africa's highest mountain. Tanzania's Southern Safari circuit is less visited, despite the abundant wildlife that inhabits the Selous Game Reserve and the remote Ruaha National Park. For a totally unique and adventurous safari experience, the Western Circuit includes the isolated and unspoilt Katavi National Park, and the chimpanzees of the Mahale Mountains National Park. Both the Southern and Western Circuit safaris require visitors to fly into their chosen safari destination, offering a wonderful birds-eye view of the wildlife as the small plane descends towards the airstrip. But it's not all just about the wildlife. The island of Zanzibar is a tiny piece of paradise in the Indian Ocean, situated just 25 miles from the Tanzanian coast, and 6° south of the equator. Only 60 miles long and 20 miles wide, visitors here will delight in the fascinating history of Stone Town, with its ancient maze of narrow cobbled streets, beautiful mosques and bazaars. The crystal blue waters offer superb diving and snorkelling. 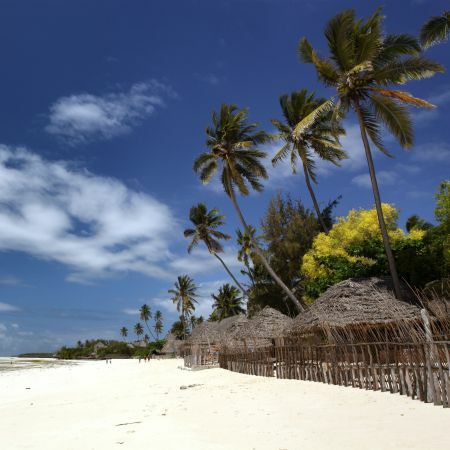 The magnificent white sandy beaches are perfect for relaxing on, making Zanzibar a wonderful place to start or end your holiday in this stunning country.